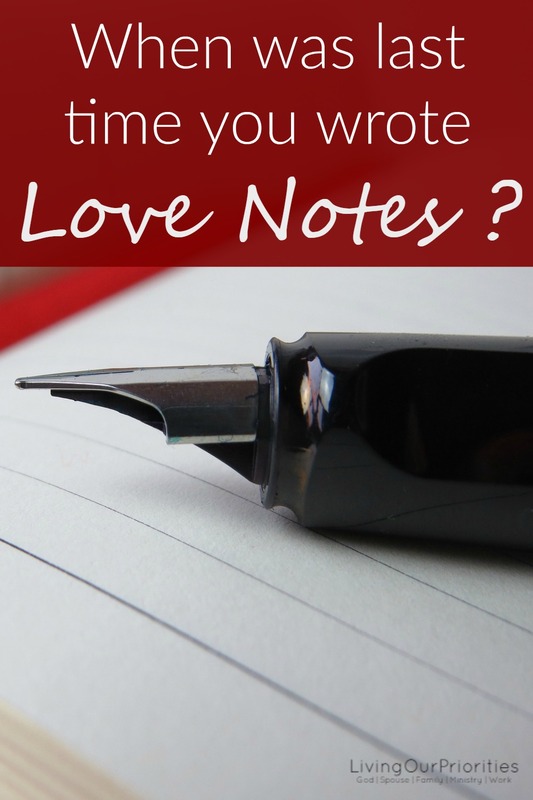 When was the last time you wrote a love note? In our modern-day society written notes have become a thing of the past. Text message has replaced phone calls. Emails have replaced written letters, and social media has become the way we stay connected to our loved ones; as opposed to picking up the phone, or meeting with family and friends. Technology is convenient. But it can’t make a person feel: loved, the warmth from a hug, or hear the sincerity in one’s heart. Seriously, how many people have taken something you “typed” the wrong way? Most family and friends want to know they are thought of, that they are loved, and that they matter. Sure it’s easy to get caught up in all the have to’s of life. Yes, we have to work, yes we have to go to school; yes, we have to take care of our physical bodies, and yes, we have to make appointments. But, how do you still do those things and make those who matter to you feel important? In previous blogs, we have given simple ways to make time for what matters. However, today we want to focus on the art of love notes. And the effect they have on the ones you love. When you think of a love note don’t just think about a love note to a spouse or significant other. Think about a love note for your children, your parents, or to a friend who may be going through a difficult time. 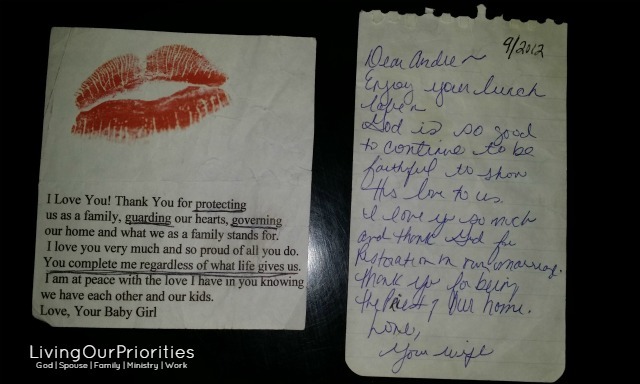 A hand-written love note cost nothing but could be valuable to the receiver. When we first learned about the priorities of God, I sought God for creative ways to show how much I love my husband and children. During the times I knew my husband needed encouragement, I would write a handwritten note and leave it in his lunch bag. Then I started leaving love notes just because I liked the element of surprise, and it felt good to let him know he is loved. I would leave notes on his steering wheel at night so when he would leave in the morning, there would be a note from me . If he had a late night meeting I would even leave a love note with his pajamas on the bed. To spice things up a bit, there were times I would spray my notes with my perfume, or kiss it with some lipstick. One day I wanted to look up a scripture and his Bible was the closes to me. When I opened it, guess what I found? That note with my lipstick! Seeing the impact on my husband, I began to write and leave notes for my kid’s. On the days I knew they were having a test; I would let them know how much I loved them. And remind them to do their best and let God do the rest! There were many times I would leave notes just because I was thinking about them and wanted them to know how much I loved them. As a society, we have lost the art of hand-written notes. But, let’s turn the tide and start a new trend! Take a few minutes today to write a hand-written note to someone letting them know they are loved. OH yes! For our anniversary which was on June 17 we’d been married 17 years I asked my husband for a love letter because he used to write them all the time! Alyssa that is so cool. I love to get letters and to receive them. In fact, I have gotten into the habit of sending them to my children, friends and those I serve with. A soft word warms the coldest hearts. Thank you for reading. I love this post! What a great reminder to be proactive in expressing our hearts to each other…and a handwritten note is definitely something to cherish. You’ve encouraged me to do this today for my husband! I just bought some blank notes from Target to do just this for friends and family. I’ve been feeling the urge to start #happymail. I can’t wait to see where God is going with this impromptu “random” assignment. He’s always up to something.